This page is going to be a bit of a mixed bag -- partly it will be a tour of our shop, and partly it will be a place for me to talk about construction and repair techniques which we have developed (or more often--learned from others) over the years. I have labeled this page as under construction--in a real sense it always will be since I hope to keep adding to it for a long time. Keep in touch and watch this space grow. Our shop is ideally located near the University of Minnesota, near major exits from the central freeway system in the twin cities, and about 15 blocks from my home. We have 1500 square feet of space on the main floor and 1500 feet in the basement (where the heavy woodworking tools are kept). The building used to be a small factory for a local coffee roasting company (long before Starbucks changed that industry) and I have owned the building since 1975. All in all this has proven to be an ideal space and location for our business. The front room is our "public" room for customers and features a wonderful north facing wall of windows (fabulous light to work by.) 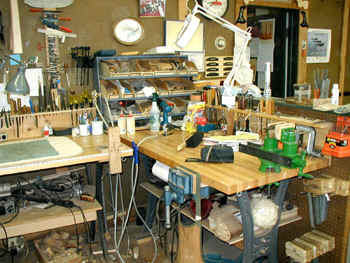 This is also the room where Michelle and I have our work benches. The display cases I have had since we opened in 1971, and the cash register has been ours for just about as long. 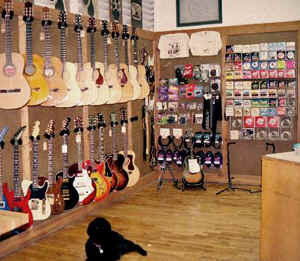 We try to keep a good selection of instruments in stock, including some of mine and some used instruments of all sorts. The photos above the instruments were taken by a friend who is the staff photographer for the Minneapolis Institute of Arts -- in return for a guitar. 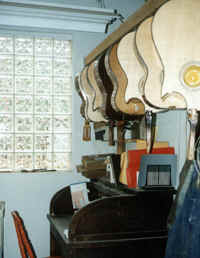 He also took the photo of his guitar in Bill Monroe's home cabin which can be seen elsewhere on this site. 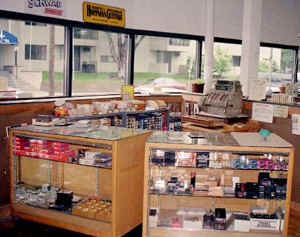 This is another view of our retail area. The large black dog is my dog, EASY. He is a standard poodle, about 10 years old and comes with me to the shop whenever I am there. This is a long-standing tradition. In the past our "shop dogs" have included a St. Bernard, two other standard poodles and Paco, Kevin's dog, who comes to the shop quite regularly. This is my work area. As my employees will quickly tell you, it is not normally this neat. The benches are made of cast iron legs which I got from Lee Valley tools and some laminated maple tops. They are very heavy, sturdy and versatile. 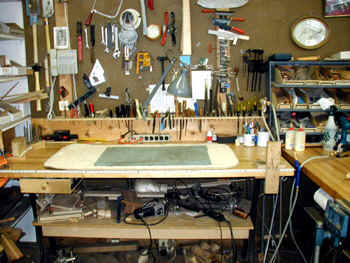 Kevin's workbench is to the left of this photo. 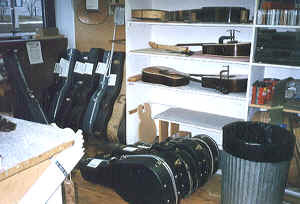 Each of the workbenches must have a sizable area near by for storage of guitars waiting to be worked on. This is Michelle's work area. 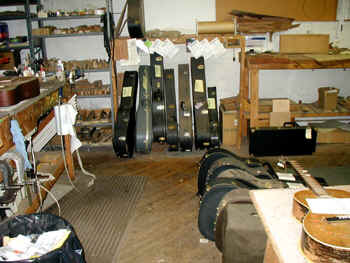 Lots of guitars, and there are two other full time repair persons. On average our shop does between 2000 -2500 repairs per year. 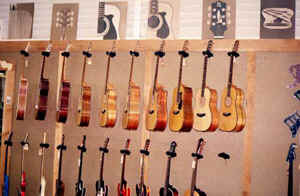 This is our "office", plus the drying rack for guitars fresh from the spray booth. The desk is an antique which has been in my family since before my birth. All of the instruments pictured are from my current production. In addition to the normal musical merchandise, we have T-shirts and, as you can see, fine art. 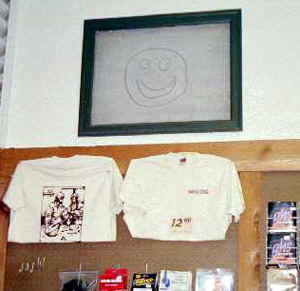 The T-Shirts are $15.00 and the fine art, since it is priceless (and part of the building), is not for sale. In order to keep this page to a size that will download sometime before the millennium, the Tools and Techniques are on a separate page.